We’d love your help. Let us know what’s wrong with this preview of Cassie Collins and the Wild Shamrock by D.B. Green. Join Kristy in this prequel to the fantasy thriller series Cassie Collins I need to find Cassie Collins. She’s the only one that can tell my story — and save others from my fate. I have to escape from Gabriel Lockwood and find her, right? Join Kristy in this prequel to the fantasy thriller series Cassie Collins and the Magic Hearts. This book will give you that roller coaster thrill ride of fast-paced event TV. Twists and turns that will not only keep you on the edge of your seat, but have you clinging to it for dear life. To ask other readers questions about Cassie Collins and the Wild Shamrock, please sign up. Cassie Collins and the Wild Shamrock is the exciting prequel to the Cassie Collins and the Wild Hearts series. For a thrilling introduction to the series, get this short story now! Already a fan? Read this to find out how it all started. Kristy Walsh, the Wild Shamrock, is trapped in a mysterious medical facility. She ended up here by breaking her contract with the infamous Senator Gabriel Lockwood. If she had only known the truth behind her agreement, she never would have signed! 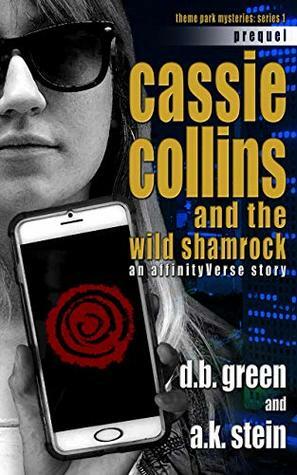 Now Kristy under Cassie Collins and the Wild Shamrock is the exciting prequel to the Cassie Collins and the Wild Hearts series. For a thrilling introduction to the series, get this short story now! Already a fan? Read this to find out how it all started. Now Kristy understands all the consequences of that contract, both to herself and others. When she broke her contract she was thrown into this facility by Lockwood. Now to free herself she must either sign a new contract or find a way to escape. Kristy has a plan to escape. She never wants to sign her life away again! With the help of another patient and a nurse, she has plans to regain her freedom. Will she be able to pull off this daring and dangerous escape? Or will she remain trapped by Lockwood? Get the prequel now to find out how it all began! A decent short with an intriguing story line. I often wonder why authors write a prequel after the original series has been out a while. Why don't they tell us the background in book one? Hey ho. Kristy Walsh is searching for Cassie Collins. She is the reporter who's career was wrecked by Senater Gabriel Lockheart for reporting on the end on Kristy's singing career. This is an amazing prequel to the Cassie stories. Kristy is searching for Cassie to tell her story. Short but amazing. I'm afraid I don't understand the control Lockwood has on all these women. I was surprised when the last page came up and I still seemed to be in the dark. I'm author of the best selling Meridia Falls series and co-author of the best selling Theme Park Mysteries series. I'm currently knee deep in my fictional universe, the AffinityVerse. The enormous amount of stories in my head finally forced their way out and created their own playground. I'm loving every magic-infused second of exploring it. I'm married and live with my wife, two kids and cats in Do I'm author of the best selling Meridia Falls series and co-author of the best selling Theme Park Mysteries series. I'm married and live with my wife, two kids and cats in Doncaster, England. As a family, we love to travel, especially to Florida, as we love theme parks. You could say that is an understatement. I love reading all genres. Physical books or ebooks on my kindle, I don't mind, so long as I've always got a good novel to read. Some people say they can sleep anywhere, I can read anywhere. As soon as the page turns, my mind blocks everything else out. I'm always open to questions, comments, feedback or just if you want to say hello. I'd love to hear from you.